Cloud adoption among large enterprises is at record numbers after nearly a decade of growing investments. AWS is a market leader in serving the growing enterprise appetite for cloud. Enterprises look to AWS for the following key benefits: cost reduction, flexibility, and availability. These benefits stem from the fact that cloud means hardware utilization is on-demand, delivery is near-instant along with scale up or scale down of infrastructure, and business continuity is better guaranteed as services can be replicated across the globe. As cloud footprints are growing, organizations are looking beyond basic infrastructure as a service and are keen on getting more out of cloud investments by taking advantage of platform services to enable serverless architectures, machine learning, or intelligent networking such as automatic load-balancing and more. However, as cloud footprints start to mature, organizations are being held back by a slow, manual, and opaque database release process which threatens all the benefits of the cloud delivery model. In response, enterprises are now realizing the need to make database code deployment as fast, transparent, and automated as application releases. Deliver updates faster and more frequently. Help developers write better code. Automate the database release management process. The end goal is make sure database code can be promoted automatically and in lockstep with application code changes. With database continuous integration and delivery, software development teams can deliver smaller, less risky deployments, making it possible to respond more quickly to business or customer needs. You’ll need an AWS account, an Amazon EC2 key pair, and administrator-level permissions for AWS Identity and Access Management (IAM), AWS CodePipeline, AWS CodeCommit, Amazon RDS, Amazon EC2, and Amazon S3. From Datical, you’ll need access to Datical software. You can request a custom demo of Datical here. Install and configure Datical DB. Create a client in Datical Keycloak. Create a RDS database instance running the Oracle database engine. Set up database version control using AWS CodeCommit. Create Lambda Function to Call Datical from AWS CodePipeline. 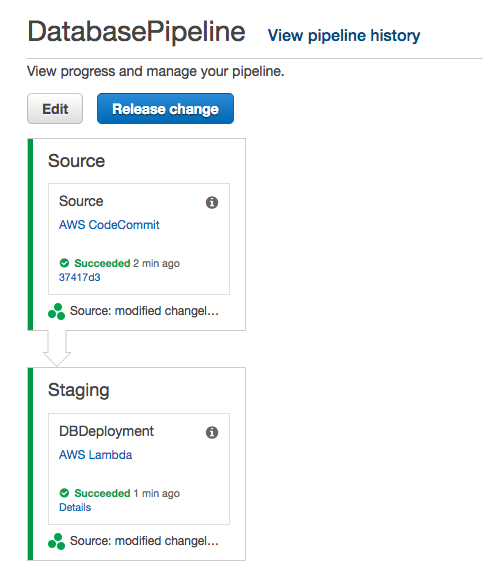 Enable automated release management for your database through AWS CodePipeline . Best practices for continuous delivery. Datical 5 is a microservices architected log running server process. As such, you will need to install it on an AWS EC2 instance. This guide assumes you will be installing on Ubuntu Server 16.04 LTS (HVM), SSD Volume Type. Datical 5 prerequisites include 4 cores and 8GB RAM. For this example, we will use a m5.2xlarge instance with 100GB of storage. Make certain that you can access SSH, HTTP, and HTTPS with your VPC configuration. The external hostname of your EC2 instance needs to be discoverable from local machine. Simply issue “sudo hostname <hostname>” to the results of “nslookup <external IP address>”. Note: On Windows machines, Datical recommends using Cygwin Shell to access instead of cmd.exe. Create the datical user, set a password, and add it to sudo and docker groups. Log in as the datical user you created. All the remaining steps must be run as that user. Open a command shell window on the server where you are installing Datical. Run the following command to download a repository from Artifactory for the installation script to use. Note: the repository is created in /opt. of datical-server has been installed. After it runs for a moment you are prompted for Artifactory login credentials. Use the account credentials you obtained from Datical. If you mistype the Artifactory repository user name or password, the installation will fail later. Restart the script to try again. sudo login prompts: Depending on your system, you may be prompted for a sudo password. Enter the password for the datical user. Wait for the services to start. The script downloads the Docker images for the services and starts Datical. Wait until all services come up before going to the next step. Run the following script to check services status. Note: if you encounter error ‘-su: datical-health: command not found’, then set the path explicitly as follows and re-run the command. All services start as status critical and move to passing. Wait for all services to show as passing. Run the following command. It pulls a Docker image that contains preconfigured databases. Note: if you encounter error ‘Permission denied’, then run below command and rerun the step. This step installs the demo PostgreSQL database. Run the top command to see that the pull and startup is complete before proceeding to the next step. Note: This step uses the same PostgreSQL database image that you set up for the application database. Start a psql command line session. When you are prompted for the admin password, enter demo. It does not echo your input. Create a user as shown. It shows CREATE ROLE when successful. Create a database as shown. It shows CREATE DATABASE when successful. In your browser, go to https://<external_url>. If your browser warns about your connection’s security certificate, select to proceed anyway. The wizard starts with a Welcome page. Click Next to continue. When the connection test passes, click Save to continue. The wizard automatically creates individual databases for each of its micro-services and creates a user with a random password for each. Enter the required information. Use values for your external Audit DB if you are using one. 3. When the connection test passes, click Save to continue. The Keycloak login page opens in a new tab. Do NOT close the wizard tab. You go back to it after you are done in Keycloak. At that time, you will need to enter the Username of Initial System Administrator. In the Keycloak application, click Users (under Manage in the left panel). 5. Click the browser tab for the Datical Initialization Wizard. Fill in Username of Initial System Administrator. If you created the user manually, enter the name of a user you created in Keycloak. If you are going to connect to an authentication service (LDAP or Active Directory), enter an existing user name who you want to have administrative privileges. Confirm the user name to use as the initial Datical System Administrator, then click Check Keycloak Setup. If the check is successful, you see the Datical login screen. 6. Log in as the Datical System Administrator user you configured. Review the user information. Click Admin > Users to see a list of all users. If you configured one user manually, you see that information here. If you configured user federation, you see a list of users. 7. Add ‘ProjectCreator’ role to the user. Visit https://<hostname/auth and log in with the ‘admin‘ user and password you set in the previous step. Navigate to Clients and create a new Client with Client ID as datical-aws. Select Save. Verify the Access Type is set to public. Datical supports database engines like Oracle, MySQL, Microsoft SQL Server, PostgreSQL, and IBM DB2. The example in this post uses a DB instance running Oracle. To create a DB instance running Oracle, follow these steps. Make sure that you can access the Oracle port (1521) from the location where you will be using Datical. Just like SQLPlus or other database management tools, Datical must be able to connect to the Oracle port. When you configure the security group for your RDS instance, make sure you can access port 1521 from your location. 2. Select Users, from the side menu. 3. Select an valid user, then choose the Security Credentials tab. 4. Scroll down to HTTPS Git credentials for AWS CodeCommit, choose Generate. 5. Store the git credential generated. We will use this in next steps. 9. Copy the Git URL for the repository. Choose the AWS Service role type, and then choose the Lambdaservice. Then choose Next: Permissions. Enter role name as ‘datical-lambda-role’ and Create. On the Lambda console page, choose Create a function. On the Blueprints page, choose Author from scratch. On the Basic information section page. For Name*, type a name for your Lambda function (for example, DaticalFunctionForAWSCodePipeline). Choose Runtime as Node.js 6.10 if it is not defaulted. Then copy the code into the Lambda function code box and save it. To create a new project, visit https://<hostname>/ as a user with System Administrator role. 1. Select Projects > New Project. Project Key – Unique identifier for the project. Optional but recommended when creating a project. Use only lowercase letters, numbers, ‘_’ and ‘-‘. It is read-only once the project is created. 1. Click Create Step. You are prompted to create a connection for the step. 2. Click Create New Connection. This is required if you have not create a connection before. Note: You need Oracle RDS information from Stage 2. 4. Click Save to continue entering step information. 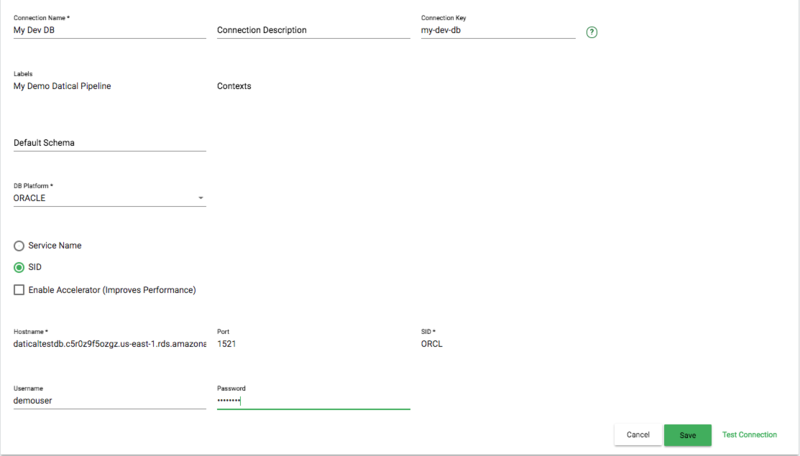 Connection (required) – select the created connection. 1. Click the Jenkins link. 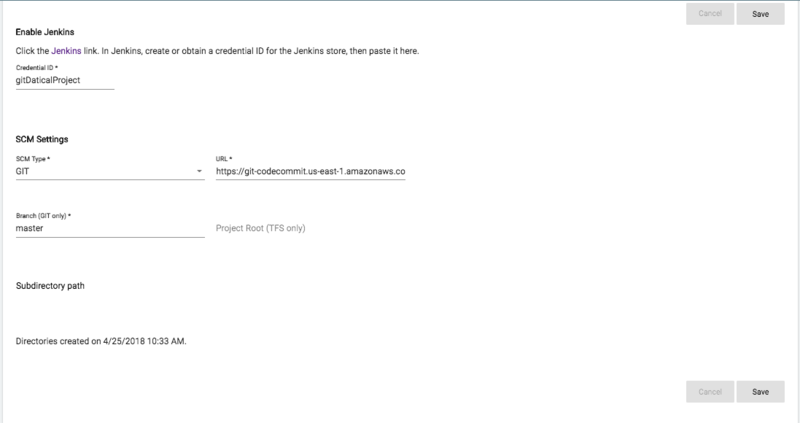 The Jenkins administrator console opens in a new tab. Note: if you are prompted for credential, then you use the same user id used for datical login. Provide credential information you download for Git Credential in Step 4. Set the ID to a string. For example, you could use gitID<projname> to represent credentials to log in to Git for this project. 6. To verify, click Credentials. Go back to the Datical tab. Enter additional information. Note: You can use CodeCommit console to edit the file or a git client. 1. In Project Settings, click the Deployment Settings tab. 2. Select values for the desired deployment behavior for this project. In this step, we use aws cli to create the pipeline. Create version S3 bucket for integrating with CodePipeline. 2. Copy the below json to a file named ‘datical-pipeline.json’. And replace attributes highlighted in <<>> with your values. CodePipeline Console shows successful execution of DB changes. 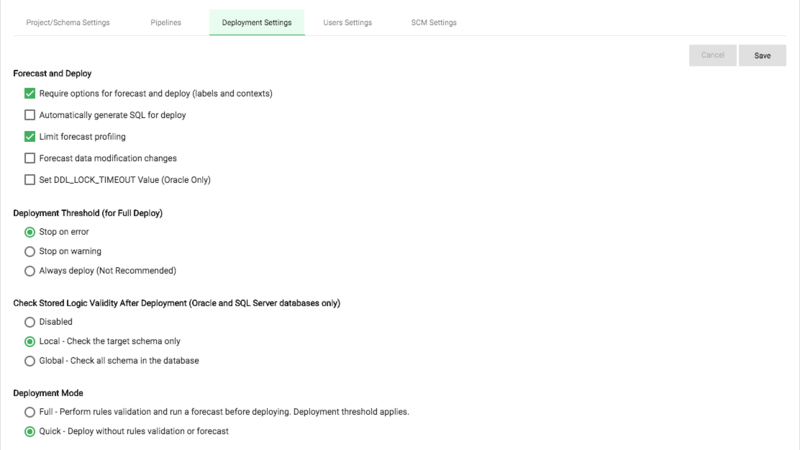 You can also review your deployment in Datical console. Just like any other files stored in your source code repository, the Datical DB change log can be branched and merged to support agile software development, where individual work spaces are isolated until changes are merged into the parent branch. To implement this best practice, your Datical project should be checked into the same location as your application source code. That way, branches and merges will be applied to your Datical project automatically. Use unique change set IDs to avoid collisions with other scrum teams. You should perform a regular backup of Datical Service in parallel with the databases it manages. postgres – The PostgreSQL database installed as part of Datical Service. It contains data for the application database and the audit database. Note: if you use an external database for the audit database, you must back it up separately. Datical Service does not provide backups for it. internal-client – The user data stored in the Jenkins internal client. Use the following CLI command to back up all services. internal-client – Backs up user data stored in the internal client service (Jenkins). They are included when you use backup all. Backups in the all directory come only from manual backups. The postgresql and jenkins directories contain automated backups and any manual backups you perform. See Auto-Backup. Only the last 10 backups are retained in the postgresql and jenkins directories. Older backups are discarded as new backups are made. There is no limit on backups kept in the all directory. Use the following command to restore backup files. You may specify the absolute path or the path from the current working directory. To perform auto-backup, cron jobs run at 12:00 am, 6:00 am, and 6:00 pm. They cannot be changed or turned off. internal-client – User data stored in the internal client service (Jenkins). Auto-backup uses the same directory and file pattern that manual backups use. You should provide tools or processes for moving backup files to an offsite location so they are available for disaster recovery. We recommend that you back up the following directory in coordination with your offline backup processes. It contains all automated and manual backups. In this post, you learned how to build a modern database continuous integration and automated release management workflow on AWS. 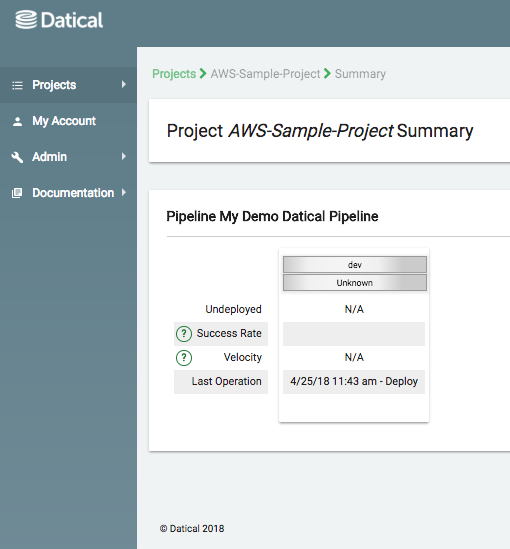 You also saw how Datical can be seamlessly integrated with AWS services to enable database release automation, while eliminating risks that cause application downtime and data security vulnerabilities. This fully automated delivery mechanism for databases can accelerate every organization’s ability to deploy software rapidly and reliably while improving productivity, performance, compliance, and auditability, and increasing data security. These methodologies simplify process-related overhead and make it possible for organizations to serve their customers efficiently and compete more effectively in the market.